The clinic has sophisticated diagnostic equipment installed to help us establish diagnoses accurately and quickly. We have the equipment for x-rays, ecg’s, ultrasound scanning, blood pressure measurement and urine analysis, blood cell counts and biochemical screening. 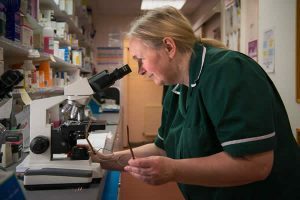 We have access to outside labs for more specialised tests such as hormone assays and pathological analysis of biopsies and tissue samples. Sometimes diagnosis is only possible through surgical exploration of the body and in some cases, the problem can be fixed at the same time. For example, if we suspect a blockage in the intestines, an operation will be necessary to confirm the diagnosis and if possible to alleviate the blockage.